Visiting any country for the first time naturally induces some confusion when dealing with the new currency. You need to learn the bills, know where to get or exchange money, and know if you need to always carry cash or pay with card? Vietnam is notoriously a very affordable country to visit, but of course travellers will still encounter things to pay for every day: accommodations, (amazing!) food, activities, transportation, etc. So, in this mostly cash-based society, what all do you pay for in cash? Some accommodations will accept card, but not all, so you will need to check with each place you stay! Many restaurants will accept card, but again, not all! And if you’re eating any street food, you certainly cannot expect to bust out your Visa to pay. Activities will usually require a cash payment, for admission or tickets. And transportation (unless you’re using Uber) will most likely require cash as well. Paying in cash usually gets you a better price too, as businesses often add a 2 - 3 % credit card transaction fee. Local Tip: Try to always have small bills (so exchange wherever you can if you don’t have any). Most often taxi drivers or food stands or markets will not be willing or able to accept large bills. Remember: Most establishments that allow credit card purchases will generally only accept Visa and Mastercard. So it may be difficult finding places that accept American Express or other credit cards. Traveller’s Tip: Most credit cards charge an international transaction fee ranging from 3 - 5 % of the purchase price. If you travel a lot, it may be beneficial to obtain a no international fee credit card. 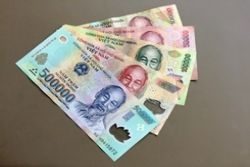 Vietnam doesn’t have the most simple or intuitive bill system, as there are many more zeros added to their currency, compared to many other countries! But a little review and a little spending will have you loving the power of the dong. Yes, the currency here is called the Vietnamese Dong. The name is interesting, yes…and it can make for some hilarious puns. The bill notes come in these values: 100, 200, 500, 1000, 2000, 5000, 10,000, 20,000, 50,000, 100,000, 200,000 and 500,000. And one wonderful thing about the currency: no coins!